The fourth installment of the Disaster Report series, Disaster Report 4: Summer Memories, is back from the dead, and it looks like the developers are aiming to show another side of natural disasters. Contrary to what has been theorized about the influence of Japan’s earthquake in 2011, the original Disaster Report 4 was cancelled due to then developer Irem overreaching its grasp in what was a highly ambitious sequel. 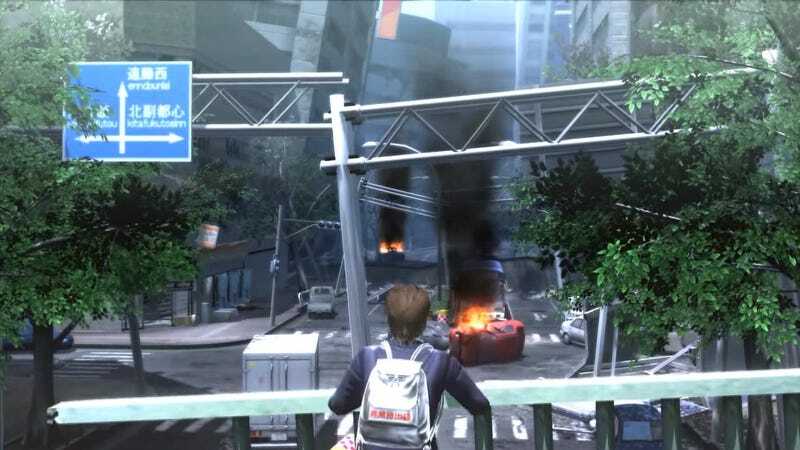 “The reason [Disaster Report 4] was previously cancelled was primarily due to the fact that it just wasn’t coming together as a game.” producer Kazuma Kujo admitted in an interview with Weekly Famitsu. “We made the city stage bigger and greedily tried to incorporate so many changes in how the game plays out that it was impossible to complete the game in the allotted time.” Now, Kujo has amassed the necessary resources to bring his vision to life. The story of Disaster Report 4 Plus involves a job-hunting student on the way to a job interview when the city is rocked by a powerful earthquake. Currently released screen shots show a girl with a knapsack walking through the ruined business district of a city, but Kujo has stated that there will also be a residential district, a port area, a station, a school being used as a refugee shelter and more. The game will be for the PS4 and Kujo has vowed to utilize the graphics capability of the hardware to its fullest. Another element of the Disaster Report games has been the thirst meter. A stamina bar that depletes over time and needs to constantly be replenished by water as if the main character was literally a wet sponge. With the duration of one week, Disaster Report 4 Plus will also add the element hunger and freshness. Food will rot over time with different foods going bad at different rates, so you’ll have to ration your food wisely, consuming the more perishable items sooner. You’ll also be able to sell food to the needy—and extort them if you’re feeling selfish. How hungry you are will also have an effect on your performance as well. With food, what goes in must come out, and the game will incorporate the everyday activities of peeing and pooping—although it is unlikely that the game will depict scenes where your character is actively dropping a load. Whether you’re listening to nature’s call or not will also have an effect on your character’s performance. Disaster Report 4 Plus: Summer Memories is scheduled for release in Japan on the PS4. No word on an official release date. Also, no word on an international release—but there should be, dammit.